The Dikapi is a hardy desert bird with a strong beak and a distinctive flute-like whistle. Although it cannot fly, it can run for hours upon end without stopping for food or rest. Some Dikapi have been trained by the Matoran of Po-Koro to carry scouts and messengers quickly across the sands. Whole lot of birds on Mata Nui, aren't there? 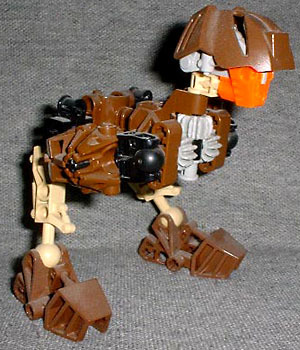 The dikapi seems to be a Bionicle version of the US southwestern roadrunner. All we need now is a Bionicle coyote to chase it. Thanks to the gears mounted in its shoulders, the dikapi's little wings flap as its head turns, which really makes it look like it's running away willy-nilly.